The 2017 Mazda Miata is a spry little rear-drive car with a cloth convertible roof. The 2017 Mazda Miata RF is the same, plus 120-pounds of power retracting targa top. The driving experience doesn’t change much between the two, but the RF is cooler. Literally. The newest Miata, for all its merits and drawbacks, has one flaw I never figured out how to overcome when I took the car on a shakedown cruise: The temperature inside in the cabin is largely at the mercy of the weather. Even with the soft roof up and the air conditioning on full blast, if it’s hot and sunny outside, it’s probably hot in a Miata. In colder weather, heated seats make coping a little easier, but generally speaking the vehicle’s climate control doesn’t stand much of a chance against the upper and lower end of temperatures you might drive in. The flap of cloth above your head just isn’t insulated enough to create a totally managed atmosphere inside the car. And that’s okay! Little inconveniences like that are largely overshadowed by the Miata’s overall awesomeness. Until you get in the Miata RF, and yeah, you realize this car sure is a lot nicer with A/C strong enough to go up against a San Diego summer. Now I only had about an hour with the RF, but heat lines were already shimmering off the car’s bodywork when we pulled it out of its parking spot. I dropped into the low bucket seat with a splash, as the inside of my jeans were as hot and wet as a greenhouse in Florida. With the car running and the roof up, I turned on the A/C, pegged the fan and to my disbelief... I got cold. This is a major step ahead for the Miata’s livability. When the sun’s too strong to have the top down, the RF will actually let you escape from the heat. While the cloth car provides shade but can’t always control of cabin temperature, the RF’s interior seal can actually trap and recirculate conditioned air pretty well. It’s not that big a deal bombing around town but if you’re planning on putting a couple hundred consecutive miles on your Miata, you’re going to be glad the A/C is strong. And you’ll probably have a much better chance convincing a partner to come with you. 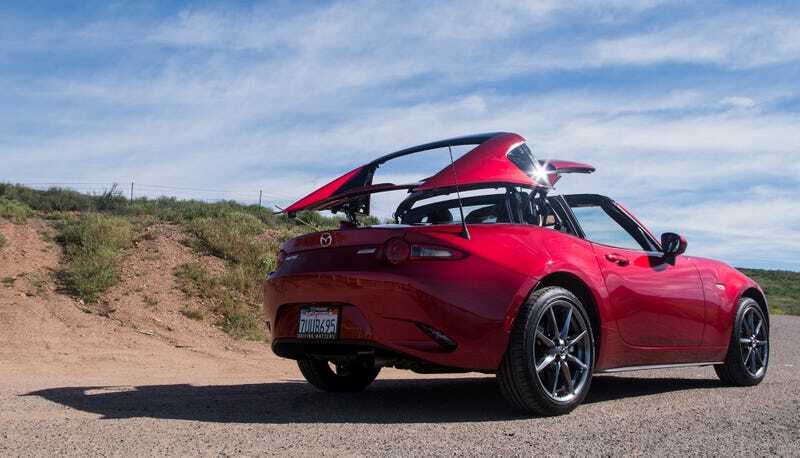 The Miata RF’s other practical advantage over the soft top is reduced wind noise. The effect is not as dramatic as you might expect, though. At highway speed, with the RF’s roof up, you’re still going to have to raise your voice to your passenger like you’re talking in a bar. Not some bar where a live band is raging a couple feet away, but two people riding in the RF above 60 mph still have to make an effort to have a conversation. Mazda used the word “premium” quite a few times as it showcased the Miata RF to us last week. The roof is power-retractable instead of a manual pop-out to please the premium customers. The better-sealing cabin is supposed to create a more premium feel in the car. The RF does feel a little fancier, if that’s what Mazda means. But I might just call the Miata RF a Miata that’s “cozier” for better and worse. The interior climate and auditory ambiance are easier to control, but you lose a few hairs of headroom and of course have to cough up about an extra $6,000. If that ends up being the case, I will not complain in the slightest. I can’t wait to see more of these beauties on the road. Is The 2017 Mazda Miata RF A Spectacular Idea Or A Giant Mistake?